Apps, websites and gadgets that target your mental and spiritual wellbeing are said to be the next hot thing in health and fitness tech. We’ve mentioned a few in the past, such as Mindbloom, and the latest to hit the web is MoodScope. MoodScope.com takes the fun element of games (in this instance cards) to help you track your mood every day. 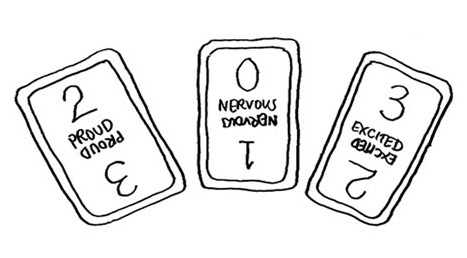 Free to join, you can track your highs and lows by logging on and choosing from a selection of twenty double-sided playing cards, each of which represents an emotion like ‘alert’ or ‘nervous’. You can flip the cards back to front or spin them head to toe to choose one of four degrees to fit in with how you are feeling that particular emotion. The scale ranges from ‘very slightly or not at all’ to ‘extremely’. Once you’ve taken the test, Moodscope will provide you with a percentage score which indicates how happy for sad you are. The creators of recommend to take the test at the same each day for best results, preferably in the morning before any events may have impacted how you are feeling. The daily score will be added to a graph, so that you can easily track your mood. Now this is not a game of solitaire. Another feature is that you can nominate someone – or more than one person if you like – to be your ‘buddy’. He or she will receive an email with your daily score, along with a link to your graph. This way, someone will always know how you’re feeling and be there for you.